Tomorrow Recuwatt Congress (Recycling and Energy) starts in TecnoCampus of Mataró. It is dedicated to energy recovery from waste. Humana is actively involved, presenting its management model textile waste on the stand which will feature in the event called Connection Area. Energy recovery from waste is a later reuse and recycling management track. It is a key element before the end unserviceable material in waste treatment centers, in which the use is zero. Humana is involved in various ways to develop an appropriate model of energy recovery for fiber waste. 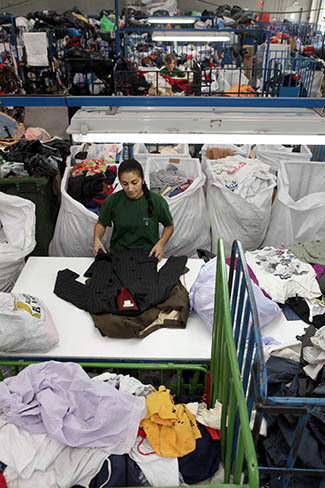 The vast majority of clothing that comes into our plants classification can reuse. Only 7% of the 10,515 tons in 2013 classified textile is bad or not made ? ?reusable tissue is sent to a waste treatment center with plastic (bags in which people deposit clothes in containers), paper, cardboard, shoes in disrepair ... in 2012, the percentage of trash was 8%, indicating that each year the level of reuse in the textile increases. In the case of plant Ametlla del Vallés, it is estimated that all this garbage can represent between 5 and 6 tons per week, ie, more than 300 each year. Humana's will is that everything arrives at the plant has an output as green as possible; ie, that everyone can take advantage of in one way or another and thus help to reduce your environmental impact and get the coveted Zero Waste. Since early this year, the trash is no longer sent to the nearest waste treatment center but the company collects Ecointel to move it to the bottom of Pronatur, whose facilities are crushed, separated elements improper obtaining a product that will serve as fuel. It's called Waste-derived Fuel. By CDR means that material with high calorific value, which generates energy that can be used as fuel to replace oil as it is more environmentally friendly and economical. The Waste-derived Fuel is recommended for ceramic or cement and power plants. "Of all the garbage that comes into our facility Montornés del Vallés can reuse the 85%," explains Jordi Moreno, Pronatur. The end result was subsequently moved to Cementos Molins, co-owner of Pronatur in Sant Vicenç dels Horts (Barcelona). "Our goal is to achieve maximum energy recovery from what we get," insists Moreno.